Humans have been making iron and steel for centuries . Steel fueled the industrial revolution and remains the backbone of modern industrialized economies. It’s hard to imagine a world without steel – be it construction, vehicles, engines or machines, steel is ever present in all we do and all we make. In the past the most commonly used type of furnace in the steel industry has been the electric arc furnace, but companies in this industry have become increasingly aware of how an induction furnace can help improve their processes and products. 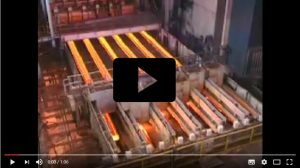 The advantage of induction furnace for steel production is something that brought excitement to small steel producers. The induction furnaces are easy to install, use and manage. These furnaces have low investment costs with lower heat emission and loved by small steel producers. With this kind of furnace, steel products are manufactured by melting materials using the heat generated by the electromagnetic field. Induction heating is used to soften, harden or bond metal or other materials that are conductive. This innovation provides speed, consistency and allows producers to control the production process. The core principles of inductive heating have been around since 1920. During World War II, this technology developed quickly to meet the wartime needs for a fast and reliable method of hardening metal parts of an engine. Recently, the focus on lean manufacturing methods and focus on advanced quality control have led to the rediscovery of induction technology. One of the things that make the induction melting furnace unique is that the heat is effectively “induced” inside the metal part itself, while the old method requires a direct application of the flame on the metal part. Below are the advantages of using an induction melting furnace. The processes involved in induction heating and melting do not consume much energy like other methods. This type of furnace uses an electric current flowing through copper coils to generate a magnetic field and the energy that heats up the substance inside or melts it. In many cases, the electric current does not have to be strong in order to be effective. It can help you save money and reduce energy costs. Induction melting furnace provides an even heat throughout the inner chamber. This means you do not have to worry about hot spots inside the oven or the inability to maintain a constant temperature. The evenness of the heat is very important especially when it comes to melting metals. Metals have a specific melting point, and it is necessary to maintain this temperature evenly for the best result. Another advantage of induction melting furnaces is that it burns cleaner than other types of furnaces. This furnace does not emit smoke; instead, it gives you clean combustion, which ensures a safe environment for employees, as well as reduces the amount of pollution in the environment. It’s a win-win situation for all. The choice of using an induction melting furnace for your melting requirements has lots of advantages over other types of furnaces. Our Induction melting furnace helps you save energy, money, and the environment. Cooldo is a company that manufactures various kinds of Induction Melting Furnaces. They can also help you customize the furnace to fit your requirements. If you are having a problem making the right choice for a melting furnace, you can Contact us for a professional advice. The Indution Melting Furnaces designed of COOLDO are not only stronger than frame based designs, but also significantly quieter, profit by the solid steel shell’s sound-deadening characteristics. Large access panels on every Heavy Steel Shell Furnace are constructed from heavy steel to protect the coil during furnace operation. They are ideal for melting all metals. Along with providing excellent durability and superior performance, they are more efficient, more productive, quieter and easier to maintain than competitive furnaces. Main Advantage of steel shell furnace. 1, More stronger and quiet than the aluminum shell. 2, more Reliable operation of hydraulic tilting system. 3, More easy operation of tilting angle. COOLDO Vacuum Induction melting furnace is one of the most commonly used heating process in matel refining and adjustment of chemical compostion to achieve the quality demands. for example, Vacuum melting furnce is indispensable in the produce of special alloys, which must be melted under the vacuum or in an inert gas atmosphere because of their reactivity with atmospheric oxygen. This process is very suitable for the production of high-purity metal within an Oxygen-free atmosphere. Circular aluminum shell furnace is mainly composed of aluminum shell furnace body、bricks (up)、bricks(down)、asbestos plate、induction coil、stainless steel screw etc.Circular aluminum shell furnace is widely used in reducer with furnace feet tilting; square aluminum shell furnace is manually tilting in general, hand wheel or lever. 3: Easy in operation, A full time operator specially for power supply is unnecessary .There is only one turn on/off switch and one power adjustment knob. Steel Billet Continuous Casting machine which is also called CCM is the necessary part in the steel making industry, the Molten steel continuously go through the water-cooled mold, after cemented hard shellbillet it will be pushed out from the mold below exit,after the water cooling process, the molten metal liquid will become solidified and then cast into the required size steel billet.and the CCM can be divided into single strand, double strands, three strands.up tp 8 strands..
Rolling mill is mainly used in steel factory which produce deformed bar, wire rod, channel steel , flat bar or other products.The production line is supposed to use continuous casting billet with size of 150*150*12000mm The allowable tolerance for section dimension of billet should be in accordance with the regulation of YB-2011-83.